Exile is, like everything else, too much of a good thing. Night after night all the things that do not change / Are startled by the changes that light brings. Eventually you ignore the traffic, even the sirens, even the disturbances in the apartment next door. The classical guitarist cannot hear the squeaking of the strings. Go and see what you don’t know is there. Strength is the ability to forgive oneself for weakness. 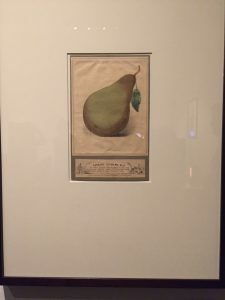 Visual puns like these are related to anamorphoses, images or projections whose full aspect can only be taken in from a single vantage point. Swiss artist Markus Raetz makes amusing anamorphoses, which you can see in this video of Yes-No (2003), a sculpture that displays the words “yes” or “no” depending on the position of the viewer. 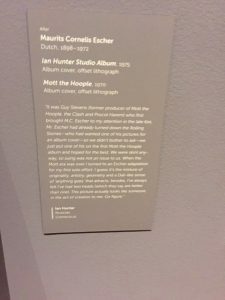 At the Boston MFA a few weeks back, I was delighted to discover some Mott the Hoople and Ian Hunter album covers—as well as an explanatory note from Ian Hunter himself—among the works in the show about M.C. Escher. 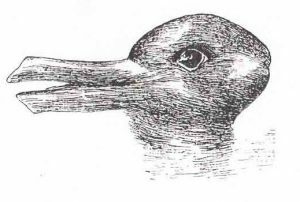 One of the most familiar ambiguous figures is a duck-rabbit illustration, which invites two distinct perceptions, both of which are correct but only one of which can be seen at a time. When seen as a rabbit, the face is turned to the right, with the long ears streaming out behind. When seen as a duck, the face is turned to the left, with the ears transformed into a half-opened bill. 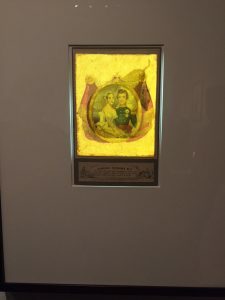 Other famous ambiguous figures include the shape of a vase created by faces gazing at one another, or a young lady coyly turned from the viewer who is also a hunched, craggy old woman. There are also more recent ambiguous figures. In 1956, British psychiatrist Lionel Penrose collaborated with his mathematician son, Roger, to create the “Penrose stairs,” which seem to be ascending and descending simultaneously. 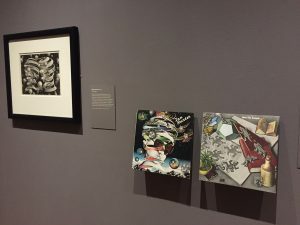 Escher created a similar effect in Waterfall, made in 1961, in which a stream feeding a waterwheel and waterfall seems to be flowing upward and downward at the same time. What is witty about ambiguous figures is that they force the viewer to do a double take, to think two different things while looking at a single image. In this sense they are like visual puns, which are used all the time in advertisements—because it’s a quick, efficient way to arrest a person’s attention. 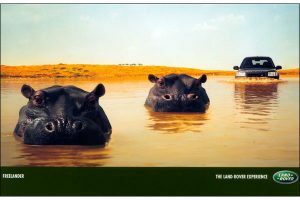 An excellent visual pun can be found in this Land Rover advertisement, depicting two hippos up to their nostrils in a muddy water hole, with the car-maker’s Freelander model driving up behind them, its headlights and side-view mirrors echoing the shape of the hippos’ eyes and ears. Which reminds me of another pun… What do you call a semi-aquatic mammal noted for its insincerity? A hippocrite.